Panasonic Lumix DM... th 12.1MP - Black. 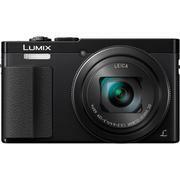 Panasonic Lumix DMC-T... with 12.1MP - Black. Panasonic Lumix DMC-TZ70 30x... Camera with 12.1MP - Black. Snap great quality pictures simply with this inexpensive travel camera. Looking for a top notch travel camera? One that won’t cost a packet yet produces million dollar photos? The Panasonic Lumix DMC-TZ70 could be the camera for you. Fun, simple, great value for money but powerful to boot, the Lumix DMC-TZ70 will capture all your great holiday moments for posterity, in glorious colour and in exceptional quality. The Lumix DMC-TZ70 has a high-sensitivity image sensor and a resolution of 12 megapixels, providing outstanding pictures. Images appear sharp and well balanced, with 100% colour reproduction, ensuring plenty of top quality pictures for the family album. And with a 1920 x 1080 resolution you can also add to the family movie collection with some decidedly crisp and professional-looking videos. There is also a great time-lapse function, enabling you to film the sun rising or the stars migrating across a stunning landscape. One of the best features of this camera is the 30x Zoom LEICA Lens. Even at high zoom there’s barely any drop off in quality, meaning you can pinpoint the smallest detail in a panorama, zoom in and take pictures as though you were standing barely metres away. An Intelligent Zoom combined with the Digital Zoom can extend the camera’s magnification to a frankly ludicrous 120x – making this a paparazzi dream come true. Meanwhile the camera’s High Sensitivity MOS Sensor guarantees superb pictures even in high or low light environments, with little noise and great clarity than you would expect from an entry-level camera. The Lumix DMC-TZ70’s Live View Finder is a great companion for photographers of all levels of experience making it very simple to frame and compose your photos, while the helpful Control Ring feature gives you complete manual control of zoom, exposure and focus. And with an incredible 10 FPS High Speed Burst Shooting, you can capture fast-moving images with no loss of focus. The dimensions (64.6 x 110.7 x 34.4 mm and weighing in at just 217 grams) make this one of the more portable cameras on the UK market. It easily slips into a jacket, making it a must for holiday goers. The DMC-TZ70 has introduced a larger, sturdier handle in front than its predecessor, making it easier to keep stable while taking photographs despite its diminutive frame. Why you should buy it: The Panasonic Lumix DMC-TZ70 is a great little camera for the spontaneous snapper wherever you may be. Easy to use, fantastic value for money, and taking superb-quality images – this comes highly recommended for UK users.